If your internet connection is good, there is really no reason to leave the home for a productive day of caffeine fueled prose. While it’s a nice treat now and then to do our work in a coffee-house or book store, developing this habit can cause a sort of cancer of budget. There are a few simple tricks and techniques for getting a cup of coffee from your own kitchen that rivals or surpasses any you will pay more money for to have served. Whatever method you’re going to use for brewing coffee, grinding your own beans allows greater control of flavor. Depending on your brew method, you will want a different sized grind, or granule. No paper filter- allows any natural oils to remain present in the brewed coffee. You can see the difference, and will be disappointed that you’ve wasted so much coffee essence on paper filters. Easy cleanup- French press pots never need a cleaning cycle, and they don’t need much elbow grease. Comparable prep time- French press coffee is no more difficult than drip coffee, and only takes longer for the water to boil, if you’re using a regular pot or kettle on the stove. Some electric water kettles can have you going just as quickly as any timed drip maker. The simplest and most natural method for getting a nice foam on top of your homemade French press pot of coffee is to add sugar first, immediately after coffee is poured into a warm cup. By sprinkling the sugar over piping hot brew, the dissolve effect or reaction is so swift that it causes a very nice foam, enhanced if using half and half or cream. 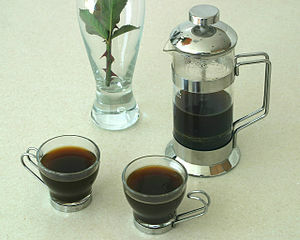 When using the French press method of coffee-brewing, opinion is variable as to the proper amount of time to allow brew. In my view, five minutes seems to be the magic number for pulling the brew while it’s still hot enough to be beneficial. If the coffee has had time to cool, it is necessary to re-heat it, either with the microwave or on the stove top, in order for the sugar or other additive to foam. If you’re re-heating, be careful not to scorch your brew. Do not add the sugar or cream until after the coffee is hot! Final trick- don’t disturb the additions too much. Lightly sprinkle the sugar, and lightly pour the cream. Let them blend naturally as the temperatures mingle. Try it- this is a process that can be tasted. Cheers!